A former pilot to the Royal Family and Henrietta his wife, an Air Traffic Control Officer, get 'Out of the Rat Race'. From the Cotswolds, Oxforshire to a remote Greek Island. 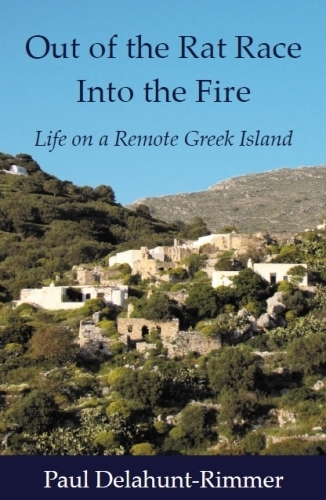 Containing many anecdotes of island life this book permeates the traditional culture of Amorgos. It describes the trials and tribulations of living with no modern amenities and some of the resultant hilarious situations. This beautiful island with its craggy mountain ranges, clear blue sea and sky is an escape from the modern world. Some of the local characters and their little foibles bring to life an existence that has survived untouched for centuries. Substituting the fight deck of an aircraft for the rolling deck of a ship and the leather seats of a Jaguar XJS to the hard saddle of a donkey. Changing from switching on an electric light to lighting oil lamps or candles and turning on a tap to lifting water out of a well. These are some of the smaller changes that were managed with apparent ease. Over a decade later the author and his wife, Henrietta, are still there and very happy with their very basic existence. This book will make you think about your own way of life and the true values of modern needs.